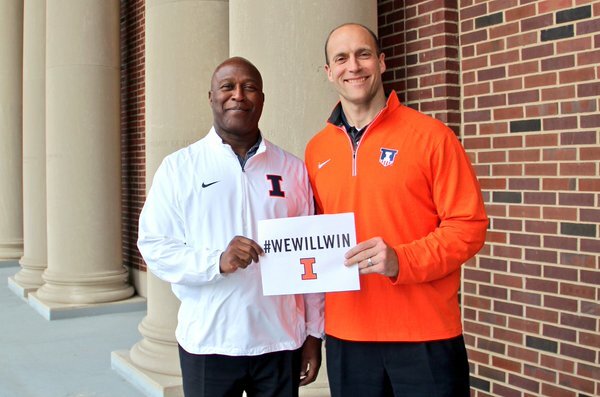 New coach Lovie Smith and new AD Josh Whitman are building Illini excitement. Go ahead, Illini Nation. Get excited. You deserve it after a seemingly endless stream of bad news coming out of Champaign in the last year. I wouldn’t start planning on Pasadena yet. 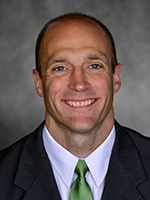 But in hiring Lovie Smith, new athletic director Josh Whitman has knocked it out of the park. With Lovie, Whitman has made Illinois football relevant. People are going to pay attention for a season or two—just to see how this all turns out. And by then, if Smith’s NFL pedigree helps him lure the right talent, the Illini should be competitive enough to carry the ball from there. Almost lost in the excitement of Smith’s stature is the fact that he is the first minority coach in football or men’s basketball at Illinois. That was a concern for many alumni—and that has now been addressed with a coach whose profile is so high he overshadows the minority issue. Of course, there are going to be questions to answer. @ How will a 57-year-old coach who last coached in college in 1995 handle the rigors of recruiting? That’s especially true at a place like Illinois, which has not been a great draw for football recruits. A lot will depend on Smith’s interest level, but he’s saying the right things going in. Recruiting also will depend on his staff. We’ll know a lot more about that very soon. Since Dwight Eisenhower left the White House, Illinois has had 11 head coaches. Only two of them have left Champaign with a winning record—Mike White, who ran afoul of the NCAA, and John Mackovic, who ran off to Texas. But there are reasons to think Smith can buck that trend. For one, he’s a proven winner, a defensive cover-two wizard. Even those who would prefer a coach with more of a flair for the dramatic need to admit that Smith can coach, if he has talent. For another, his nine-year run as Bears coach gives him a profile in Chicago, where he’ll need to lure recruits and excite Illinois’ alumni and other fans. And his low-keyed, family-oriented style ought to play well Downstate. That’s one of the dilemmas of Illini Nation, uniting its two geographically distinct fan bases. Another plus for Smith is being in the Western Division of the ever-expanding Big Ten. Although Smith was asked at his introduction when and how he’s going to beat Ohio State and Michigan, he won’t have to do that until the conference championship game—which would be a major achievement in itself. The Big Ten is top-heavy in the East. The Buckeyes and Wolverines are juggernauts. Michigan State is flourishing. Penn State could regain its mojo at any time without shocking the world. The West? Not so formidable. Nebraska has lost its way. Wisconsin is transitioning to a new coach who may or may not build a perennial power. Iowa and Northwestern are very good at what they do. But the East is the side that’s perilous for a new Big Ten coach. Skeptics—and I’m going to include myself in this category—want to see whether Lovie can turn the Illini from an after-thought to an actual Big Ten success. Some of his staff moves—such as firing Ron Rivera as Bears defensive coordinator—are easy to second-guess. In addition, in more than 20 years of being around Illinois football, I’ve seen all the ups and downs. Ron Turner looked like a pretty good hire because of his dynamic offense and NFL background. He seemed poised for greatness when Illinois reached the Sugar Bowl in his fifth year. Surprisingly, he couldn’t translate that into recruiting success—and was gone three years later. When master recruiter Ron Zook guided Illinois to the Rose Bowl in his third season, he too looked like the answer. That also got messy. It’s more difficult to recruit to Illinois than at many Big Ten schools. There are many reasons for that, which I will save for another day. It just hasn’t happened down there. Will Smith be able to turn that around? We’ll find out. The bottom line is, Whitman deserves the highest praise for acting quickly and decisively. There’s excitement surrounding Illini football. There are no guarantees that Lovie Smith will restore Illinois’ football program. But he has already created interest that would have been unthinkable a week ago.